Very nice book of children's nursery rhymes done by Ruth Newton. 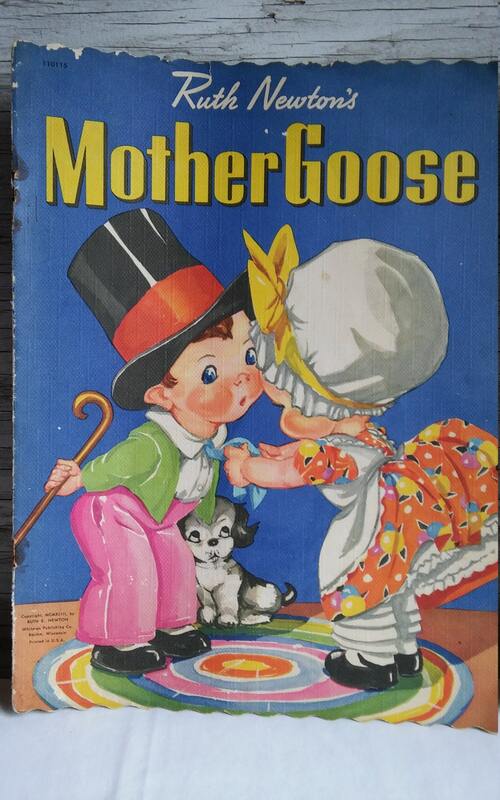 This book was published by the Whitman Publishing Co. Racine, Wisconsin in 1943. The inside pages show very light wear. None of the pages are torn and no pages have any writing. The cover shows some wear to the top left. There is light wear to the spine. Since this is a book of a few pages it was originally stapled and one staple is missing. It is a very nice collectible and would be a nice addition to your collection. Ruth Newton was a illustrator for Whitman Publishing over 20 years. Ruth had a long successful career as an illustrator and designer. This book is nicely priced at $30 and this price includes shipping in the USA. Shipping outside of the USA is negotiable with the seller, just ask me. Vintage 1927 Edition of the History of New York State in 5 full volumes with a 6th volume being Biographical. Lewis Historical Publishing. Vintage 1993 SSCA Baseball Hall of Fame Legends in First Day Covers Babe Ruth, Lou Gehrig and Ty Cobb in Near Mint Condition. Vintage Possible 50s or 60s McCoy White Goose Cookie Jar. #166 or #991 on Base. Ex Cond. No Cracks or Chips. Gr8 Gift Idea. Free Ship USA. Vintage Pair of Nicely Carved Onyx Bookends. Both look to be Aztec or Indian or maybe Egyptian or possibly Alien gods! Lead Glass Duck. Acid Etched on the Bottom ART VANNES FRANCE. A great gift idea. Vintage 1960s 4 Bowl Set by Pyrex. All are numbered. No Fading with this set. Nostalgic. Like the set your mom or grandma used daily. Beautifully Crafted 12" Long and 5" Wide Lusterware Tray. Made in and Painted in Japan. Great Gift. Manufacturers Mark. Free Shipping USA. Vintage Made in Macau Black Sequined Over-the-Shoulder bag. Vintage 5 1/2"x3"x3" Art Glass Elephant. Beautiful Clear Glass with Swirls of amber and green. Great Gift Idea. Free shipping in the U.S.A.
Vintage 1984 Toronto's Hard Rock Cafe Sweatshirt. Gently Used Condition. Now has some signs of its age. Medium/Large. See all pictures.